In the beginning, before time and space, paved pathways, and constructed landscapes there was a state of nothingness; within the void resided spirit beings and chaos. The ordering of chaos formed the elements, and from the elements came heaven, earth, and man. As social beings, humans developed mythologies explaining the creation of the universe, and through these narratives defined the code of man in relationship to the landscapes they occupied. Identifying with these stories, we become active participants in the divine powers of mythology. 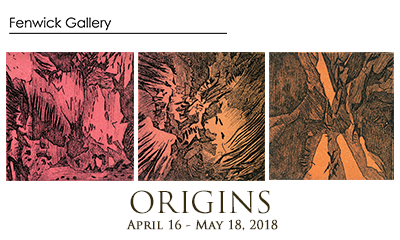 “ORIGINS” is an exhibition featuring ELEMENTS, a MFA printmaking collective from George Mason University. Representing four of the elements (Fire, Aether, Water, Earth), the artists created work in response to the function of their element in mythology, capturing the essence of being through the creative practice. Collectively, the work in the exhibition forms a modern creation story. Join us for a discussion with the artists of Origins on Wednesday, May 2 from 4:30-6:00pm in the Fenwick Library Main Reading Room, located on the second floor of Fenwick Library.